If you are looking to spend some time in a place of outstanding natural beauty, you can't go wrong by picking the Gower Peninsula in southern Wales. And don't just take my word for it, as in 1956, the Gower peninsula did literally receive the title of "Area of Outstanding Natural Beauty." And beautiful it is indeed. For accommodation, there are several options in the area. You can stay at a quaint and traditional local bed & breakfast, or a small hotel. However, if you prefer to be a little more independent, you can choose from some lovely cottage rentals on offer in the area. You have a choice of quiet romantic country retreats with country or sea views, or if you prefer, family cottages and apartments are available in busy city waterfront areas. Covering around 188km², the area is famous for its seemingly endless coastline, popular with both walkers and outdoor enthusiasts. While the northern coast has fewer beaches, it is home to the cockle-beds of Penclawdd. For those with the beach in mind, the southern coast has a whole series of small rocky or sandy bays. 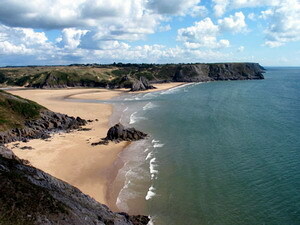 These include Three Cliffs and Langland, as well as Oxwich Bay, Rhossili Bay and Port Eynon. Some of the beaches have the coveted Blue Flag status and Seaside (2006) award due to their high standards, including Bracelet Bay, Caswell Bay, Langland Bay and Port Eynon Bay. The area is not all about sandy beaches, however, and offers some wonderful walking away from the water. You can scale the heights to the highest point of Gower Peninsula at the Beacon at Rhossili Down, which overlooks Rhossili Bay. Stroll and enjoy Pwll Du and the Bishopton Valley, which together form a statutory Local Nature Reserve of immense beauty in the area. 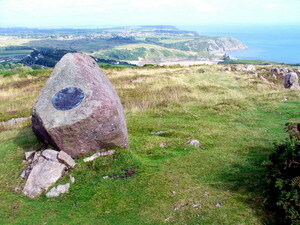 Gower Society Stone - Photo courtesy Colin Smith At the eastern end of the Cefn Bryn ridge, on the grass-topped spine of the Gower Peninsula you can visit the Gower Society Stone, a monolith about 4 feet high with round metal plaque (pictured left). If caves are to your fancy, there is the Llethryd Tooth Cave, or Tooth Hole cave, which is a Bronze Age ossuary site in a limestone cave located on private land along the Parc Cwm valley, near the village of Llethryd. At nearly a mile (1,525 m) long, the Tooth Cave is the longest cave in Gower. Fancy a round of golf? You will be pleasantly surprised at what Gower can offer you. There is a Championship status golf course at Fairwood Park and the Welsh PGA Championships were twice held there in the 1990's. Also of interest is the Gower Golf Club at Three Crosses, which hosts the West Wales Open. For those enjoying the historic aspect, there are several castles on offer in the area. You will have a feast on offer when visiting Bovehill Castle, Oystermouth Castle, Oxwich Castle, Pennard Castle, Penrice Castle and Weobly Castle. The area also has some fame in the UK media, with the village of Mumbles being the set for a six-part drama Ennals Point featuring Welsh actor Philip Madoc. This series first aired in January 1982 and featured a local lifeboat crew. A film was made by Gee Vaucher and musician Huw Warren, called "Gower Boy", which was described as a "gentle, contemplative exploration of the Gower Peninsula in Wales". The film debuted at the 14th Raindance Film Festival in October 2006. Doctor Who fans will be interested to note that the village of Rhossili appeared as a location in the 2006 Doctor Who episode "New Earth". In that episode, apparently Worm's Head could clearly be seen. All in all, Gower is an "Area of Outstanding Natural Beauty" with much interest to suit everyone's tastes.